Are you new to the world of school based physical therapy? Maybe you are a seasoned veteran of the school based therapy world, but you are looking for a more efficient way to document? School based physical therapy documentation (and occupational therapy) can prove to be challenge as most districts are not equipped with any sort of documentation system for pediatric therapists working in the school setting. As school based therapists we need to be aware of what is required of us from the school perspective, but also from a practice act perspective. APTA’s “Defensible Documentation for Patient/Client Management” states that PTs should document each PT session (including cancellations) and stipulates that the IEP may include the plan of care. With technology today, there are easier ways to make documentation more efficient. It is important that before you select any type of documentation that you are aware of what kind of security is in place in your district with the documentation programs you select. Paper and Pen – There is nothing wrong with this if it is the option that you choose. It may not be nearly as efficient, but for some it is still their best option. Others may choose to type up each individual note in a program such as Microsoft Word. Microsoft OneNote – I personally am a huge fan of using OneNote. This option allows you to organize by section and create folders for each school or child. It literally can eliminate all paper based daily note documentation. It also allows you to easily import pictures and print from the internet directly into the note system. It is what I personally used, love, and saved tons of time. I wrote a full blog post on special education documentation using this option. Google Docs – Some school systems are set up on Google Docs and therapists have found this to be an efficient way to coordinate and track all of their documentation required for school settings. School System Documentation – Some school systems have documentation systems where you are required to enter in information for Medicaid billing. In some cases this may be an efficient enough system for some therapists to use given their caseload and setting. Evaluation write-ups can take up a huge chunk of time for school based physical therapists and occupational therapists. There is good news on this front as a new app is in place in regards to making evaluations more efficient. Double Time Docs (affiliate link) is an app out that allows you to check boxes instead of writing big sentences. The app does it for you. They offer a free trial. I’ve heard a lot of good things about saving time using this app. Once you are finished you are able to get your report in Microsoft Word format. They have options for OT’s, PT’s, and SLP’s. 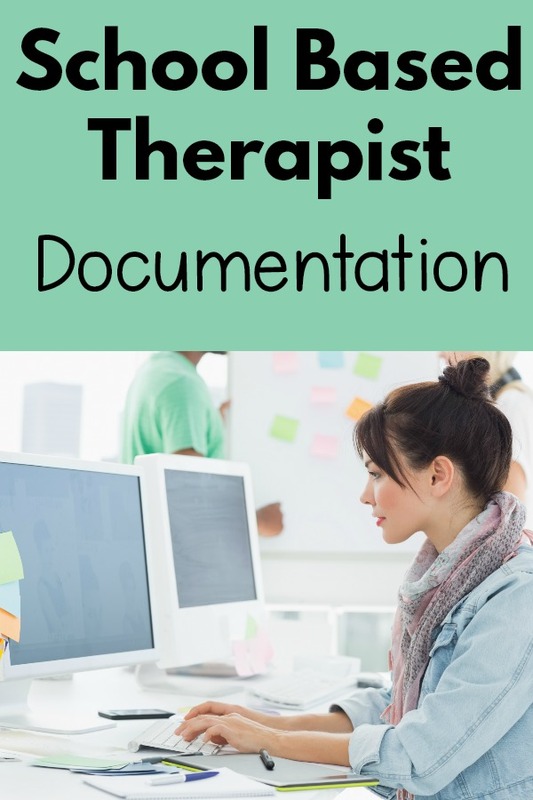 Do you know of any other great documentation resources for school based therapists? Let me know!